Those who need to repair their umbrellas, now just have to contact Haneefa. He will come riding his scooter and fix the umbrellas in no time. Kallachi Payanthong native Haneefa (55) has taken a new way to better his job. He travels from place to place and repairs umbrellas. With the arrival of monsoon, Haneefa is busy all the time. 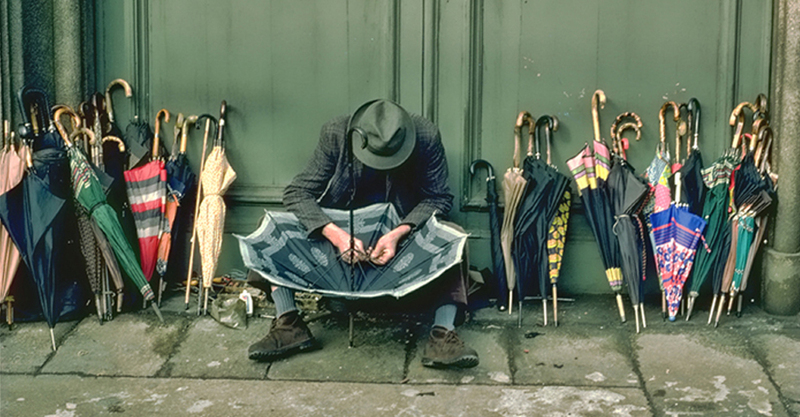 He used to repair the umbrellas near shops in the town. But when the customers did not return to get back the repaired umbrellas, Haneefa decided to find a new business trick. Instant payment is major feature of repairing umbrellas at houses, he said. Rs 50 for changing the ribs of the umbrella, Rs 100 for changing the pole and Rs 100 for replacing other parts. Sometimes, even the entire umbrella is subjected to a makeover by changing the canopy fabric. As people tend to forget umbrellas in places, many are interested to repair the old ones, Haneefa said. He repairs from 10 to 20 umbrellas a day. Haneefa owns a band set named ‘Ragam and he is also a magician. As a side business, he also sells Ayurveda herbs.